Deep Peels reach the deepest intra-epidermal layers where the skin peels in large segments. Most skin types become brown and crusted prior to considerable peeling, occurring three to four days after application. The typical recovery period lasts seven to ten days, with treatment up to twice per year. A deep peel restores and renews skin with the most dramatic results. The VI PEEL will help to improve the tone, texture and clarity of your skin. It helps reduce and possibly eliminate age spots, freckles and melasma. It softens lines and wrinkles, helps to clear acne, reduces acne scars and stimulates the production of collagen for firmer, more youthful skin. VI PEEL works well for all skin types (Fitzpatrick 1-6). What this means is if you are of a darker skin tone (African American, Hispanic, Asian, Western or Eastern Indian), its safe for you to get a VI PEEL. Regular use of the VI PEEL (2 to 4 deep peels per year), along with proper home care, reverses sun damage. This deep peel is also suitable for the eye area, chest, hands, arms and back. There are numerous brands of deep peels at every strength and price point. Most of them produce the same results as the next brand. 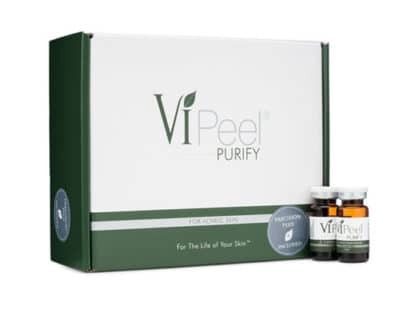 I chose VI PEEL because of its unique qualities that stand apart from the rest. 1. The level of discomfort is next to nothing. The VI PEEL is virtually painless, no prep necessary and great for every skin type. Other deep chemical peels Celebrity Skin offers are compounded from a local pharmacy with different formulas and strengths to meet different skin types and conditions. The pain level is more significant but is short lived (about two minutes of a stinging and itching sensation). These deep peels are slightly less expensive because of this and because you are not paying for the brand name. They are equally as effective depending on your particular concerns and needs. Can I Deep Peel Other Parts of My Body? Yes! I highly recommend it. Get rid of all that unsightly sun damage and improve the health of your skin everywhere. We can deep peel your arms, legs, back, etc. Some of the more popular body parts, also known as “the forgotten zones”, are the skin on the neck, chest and hands. The skin on the neck and décolleté is thinner, contains fewer sebaceous glands and is often forgotten when applying corrective products and sunscreen. The skin on your hands often looks the most aged and spotty. A Mid-Depth peel will help to produce noticeable improvement in the texture and tone of your hands. To learn more about deeper chemical peels book your appointment online now.